Summer is quickly approaching and what better way to celebrate than with an icy cold smoothie featuring the best of nature’s bounty? The Grand Cru glassware line from Rosendahl Denmark is perfectly suited to showcase these brightly-colored treats with its elegant form and characteristic sunken line. Grand Cru glassware was designed by Erik Bagger for Rosendahl Denmark. The line embodies everything that Scandinavian design is known for: functionality, simplicity and beauty. You’ll find Grand Cru in the Copenhagen Opera House and in the MoMA dining rooms. 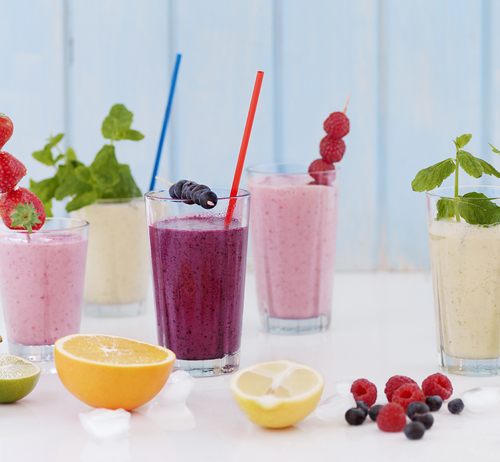 But only once they are in your kitchen can you fill them with luscious fruit smoothies that celebrate the transition from a blossoming spring to a glorious summer. Put all ingredients except ice cubes and fresh berries in a blender and blend to a foamy mixture. Pour immediately into glasses, add ice cubes and decorate with fresh berries. Makes 2 glasses. Shop Fjorn Scandinavian’s Rosendahl Grand Cru collection. this looks yummy & seems healthy too! i might add a jigger of gin or vodka too. very refreshing!